Cottage in Wardija, near St Paul's Bay - Secluded with Various Beaches Within 10 Mins drive. The main house, Dar ta L-Argentier, was built well over 100 years ago when it was probably used as a shooting lodge. In the grounds of this lovely home where the owners live is 'The Cottage' which is available for self-catering holidays. In the peaceful surroundings of this rural area, this accommodation has all the amenities of home, and is adjacent to a large pool area, freshwater swimming pool and sunbathing area. The pool is also used by the owners who live in the main house. St Paul's Bay is 5km away and the beaches of Golden Bay, Ghajn Tuffieha and Gnejna are only a 10 minute drive. A car is essential as the bus service has been discontinued. A good supermarket and regular bus service are located at the bottom of the Wardija hill about 4km. I am British and lived in this wonderful location for over 30 years. I love to travel but always look forward to returning to Wardija which is still an unspoilt area in the north of Malta. My husband and I live in the main house. Over the years we have transformed the 3 acres of land around the main house and the Cottage which are surrounded by lawns, numerous olive trees, palm trees and different shrubs and flowers. The kidney-shaped fresh water swimming pool with a large deck area is completely secluded with country views with St Paul's Island beyond. En-suite bathroom to bedroom with shower, wc, bidet, wash hand basin and hairdryer. Bed linen changed after 1 week. Living/dining room with wooden French doors leading to pool area. Satellite TV and Wi-Fi. Comfortable sofa converts to a double bed. Swedish design dining table and 4 chairs. Overhead fan. Working wood-burning fireplace. Small balcony overlooking garden. Kitchen fully equipped with fridge/freezer, dishwasher, microwave, gas/electric oven and 4 burners, toaster, kettle and all necessary crockery, glassware, cutlery etc. Living/dining area with double wooden French doors immediately in front of pool and deck area. Swedish design dining table & 4 upholstered chairs. Working fireplace. Small balcony overlooking garden. Local information brochures and various paperbacks to use. 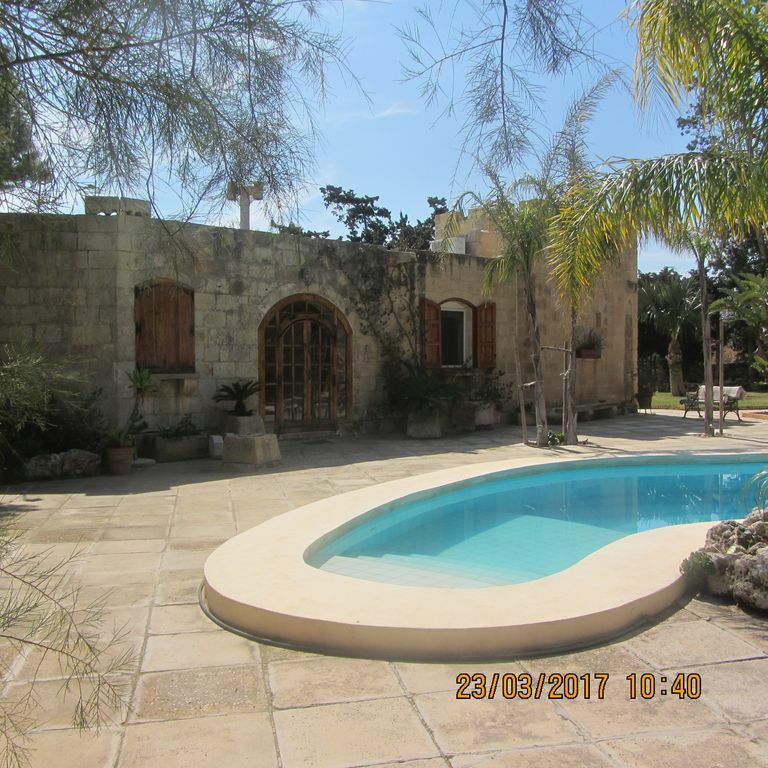 Large garden with 3 lawns and numerous olive trees and palms etc. Deck area surrounding the pool. The Royal Malta Golf Course is approximately 30 minutes by car. The large fresh water pool and deck area is also used by the owners. Outside: Lawns and gardens. Kidney shaped freshwater swimming pool. 3m deep with shallow area. Approx 16m long x 8m wide. 2 sun loungers and 2 garden chairs. Gas BBQ. The pool and pool area is also used by the owners of the property. Cleaning / Towels / Linen / Maid service: Bed linen, bath towels and beach towels are provided. Linen and towels changed after 7 days. Other: All windows are fitted with insect screens. What a find! We had the most wonderfully relaxing two week holiday in this fabulous self catering accommodation. It is secluded, quiet and conveniently situated for exploring the island by car. The grounds really are quite special and the cottage is clean, well equipped and comfortable. Jennifer and Joe were perfect hosts, attentive and helpful without being intrusive. They even gave us perfect directions from the airport and put all sorts of goodies in the fridge. We loved it and would highly recommend it to future guests. As we arrived in Wardija (thanks to directions sent from the owners) we found a very nice secluded cottage, surrounded by a beautiful, well maintained garden on the property. It is a the perfect place to escape from the hectic life. The cottage was very clean, spacious, nicely furnished, a well equipped kitchen, outside space and barbeque area to relax and a very inviting private swimming-pool. We felt very much at home. We found the fridge filled for the first few days which helped as we arrived late evening. Both the owners Jennifer and Joe made us feel very welcome and were really helpful in any possible way. There are some lovely walks with stunning views over the island and sea. Shops and restaurants are only a few minutes driving distance. A car is useful as there is no public transport nearby. If one is looking for a peaceful hideaway with nice weather, beautiful landscape and friendly hosts, this is the place to come to. Thank you for your kind words in your review and also in our Visitors' Book. It was a real pleasure having you both as guests in our Cottage, which you left so clean and tidy. Your photos are excellent - when Graham gets fed up with cooking he can always turn to photography! I feel we have become good friends and hope we meet again either in Germany or Malta. Prettige ruimte, zeker voldoende voor twee personen. Door het tijdstip in het jaar (maart) van ons bezoek was het binnen net te doen met de voorhanden zijnde verwarming. Jennifer is een aardige, zeer behulpzame dame die graag van alles uitlegt. Hat man einen Mietwagen zur Verfügung, ist Wardija der ideale Ausgangspunkt zur Erkundung der Inseln Malta und Gozo: sowohl Valetta, als auch die Fähre nach Gozo und Maltas beste Strände sind nur wenige Autominuten entfernt. Das Cottage ist geräumig, gemütlich und gut ausgestattet. Und sollte etwas fehlen, helfen die sehr gastfreundlichen und herzlichen Vermieter gern. Der große und tiefe Pool nebst schattigem Poolhaus sorgen auch an sonnigen und heißen Tagen für gute Erholung. If you have a rental car available, Wardija is the ideal starting point for exploring the islands of Malta and Gozo: both Valetta, as well as the ferry to Gozo and Malta's best beaches are just a few minutes drive away. The cottage is spacious, cozy and well equipped. And if something is missing, the very hospitable and cordial landlords like to help. The large and deep pool and the shady pool house ensure good rest even on sunny and hot days. Jennifer and Joe are very attentive hosts and have turned their pool house into a wonderful place to relax. Their open and friendly nature made the holiday feel almost like a visit to the family. We will come back :-) ! Thank you Susanne for your kind words. You and Ingo were perfect guests and we look forward to welcoming you again to Wardija. We still have warm sunny days here with the occasional wind and rain. Dogs are missing you lots! Good Friday Pagent - Mosta & other Parishes in Malta & Gozo. Wardija Village Festa - End of July. Mosta Festa - 15th August. Mgarr Festa - 3rd week in August. Village Festas throughtout summer months. Olive picking from our garden in October. Mellieha Bay - 10 km. Malta International Airport, Luqa - 20km. St Paul's Bay - 6km. Booking Notes: Price may vary according to time of the year and duration of stay. Contact owner. Changeover Day: Flexible changeover days. Notes on prices: Contact owner as prices may change according to time of the year and duration of stay.